Zuza is a modern boat, custom built using the latest materials modern technology can offer – this makes her unique; truly one of a kind! One of the many reasons I so enjoy being her skipper is the comfort she offers whether under sail or motor. 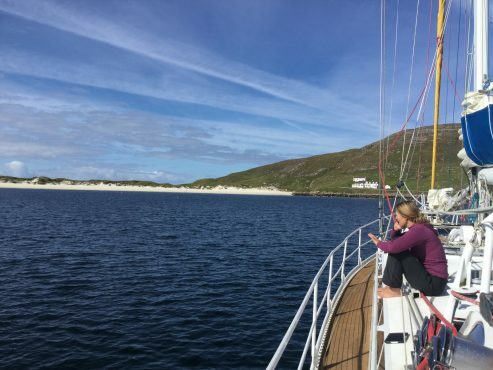 She combines comfortable living and fast sailing so that she can take you to remote destinations day after day, and as a skipper this is really satisfying. It embraces my passion for sailing alongside the knowledge that my guests are safe and comfortable. Zuza is also able to reach particularly remote destinations that other vessels her size can’t, thanks to her bilge keel design, and the 2 powerful engines enabling superb manoeuvrability. Wind and power: the perfect combination! My love of all things sailing started in my teenage years, when I discovered sailing dinghies in the Lake District… I was hooked! A yacht sailing holiday in the Balearic islands led to me taking my day skipper ticket and volunteering with the Ocean Youth Trust. This enabled me to log sea miles and learn on the job from a multitude of highly skilled and diverse skippers on lots of different sailing boats. 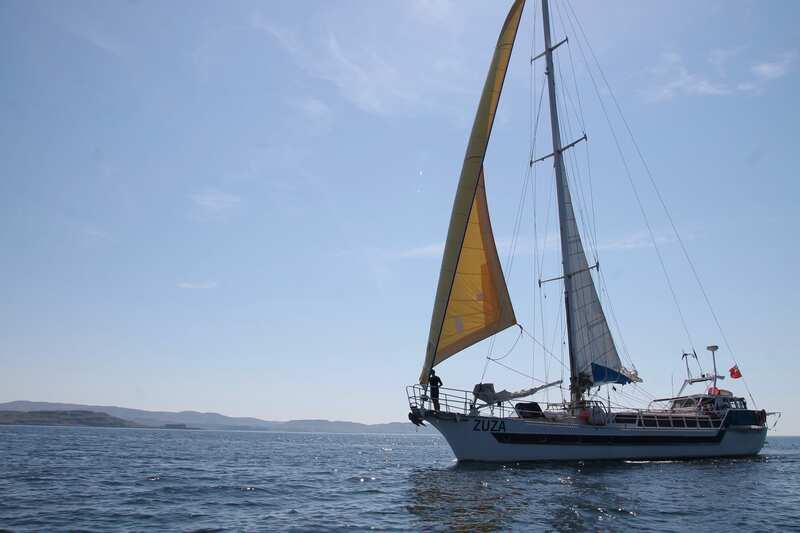 My first professional role at sea was as a flotilla skipper on the beautiful Dalmatian coast in Croatia. The next 20 years saw me in a variety of skipper roles from Brixham trawlers in Devon to the round-the-world challenge boats. I qualified as a yacht master instructor in 2003, enjoying the challenges in this role hugely and working my way up to cruising instructor trainer. One of Zuza’s many perks is that she caters for all experience levels of sailing – whether you’re a complete novice looking to learn or a seasoned sailor wanting a new experience. 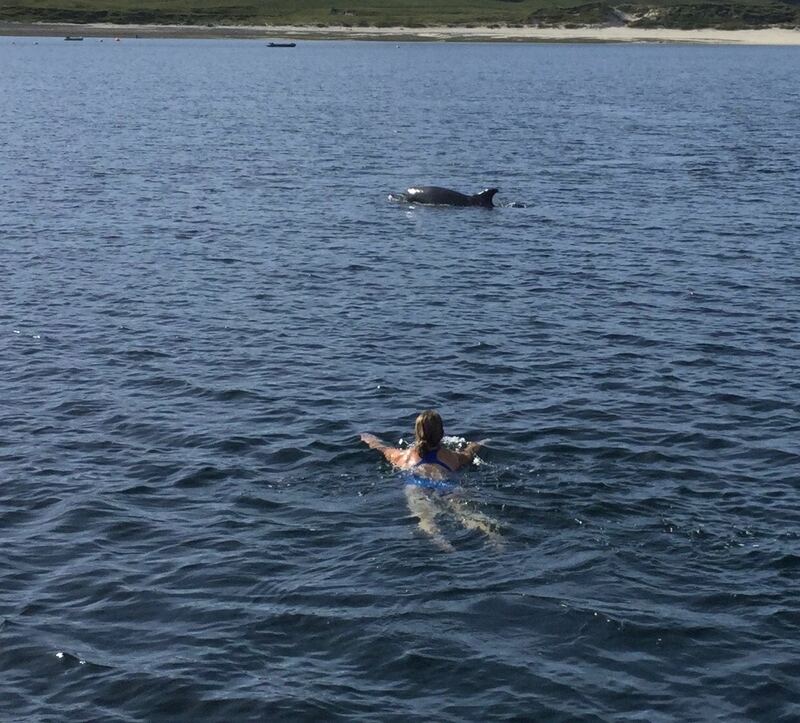 However, if you simply want a holiday on a lovely comfortable yacht with stunning scenery, food and company, my crew work hard to anticipate your every need and make you want to visit Scotland Zuza-style year after year. Another really unique aspect of Zuza is the completely enclosed cockpit with its 360 degree windows, so no matter what the weather, you’re right in the hot seat warm and dry. This is where the helm is, so you are welcome to steer Zuza and learn about all the navigation or simply sit back with tea and cake and watch the world go by. 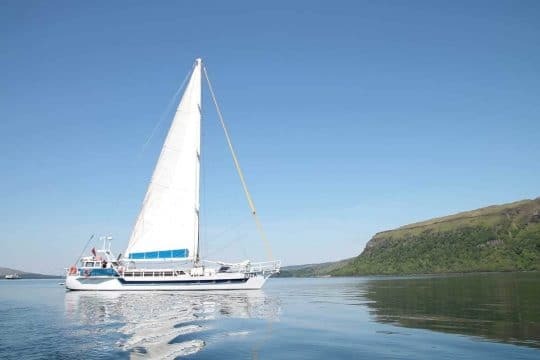 Unlike most modern yachts, Zuza has sturdy hand rails around the entire deck providing easy walking, and lots of places to sit comfortably while wildlife spotting. 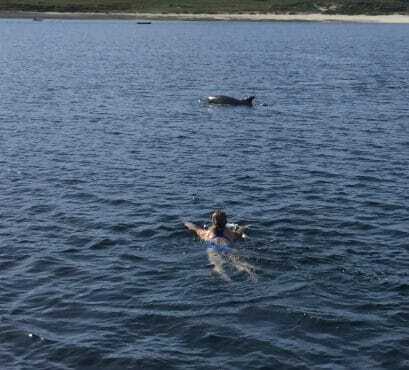 If you fancy a swim, there’s a diving platform which is also used for boarding outer tender for daily shore excursions. Three steps downstairs brings you to our large saloon where breakfast and dinner are served – lunch depends on the day! 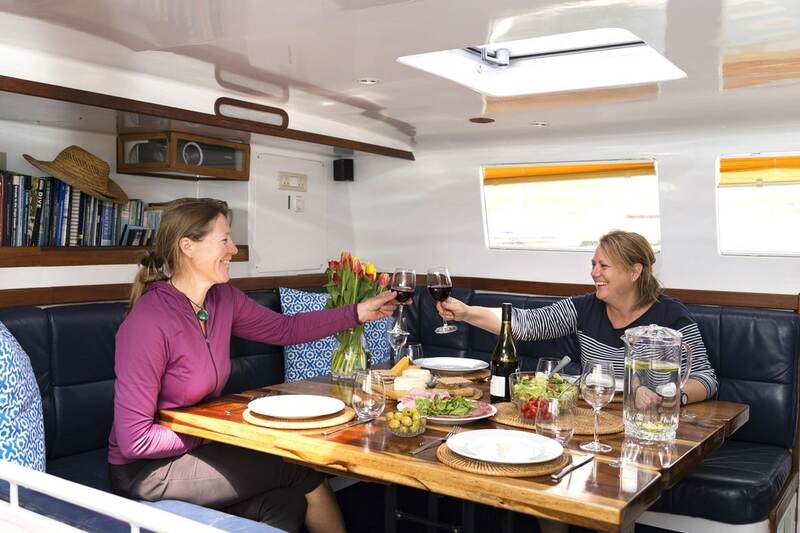 The saloon also has wrap around windows and large hatches, and a servery where you can help yourself to fruit and biscuits and drinks. 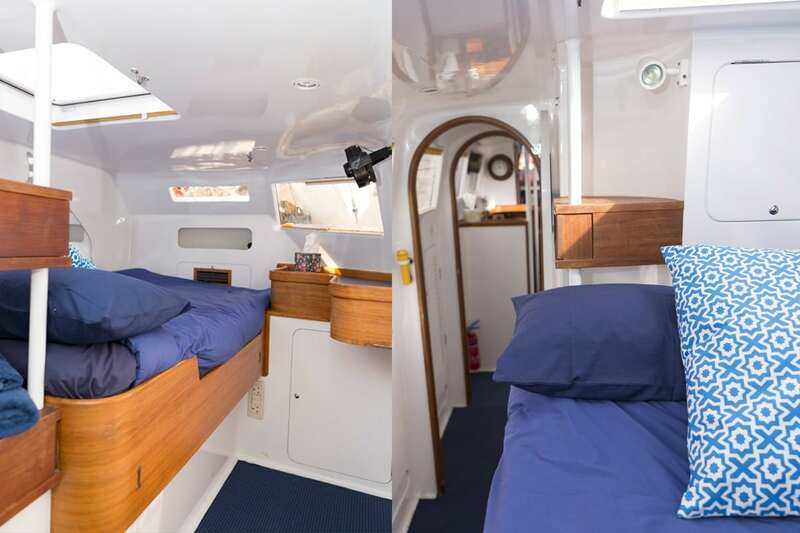 On the saloon level, Zuza has two ensuite cabins, where you can lay in your double bed with the hatch open watching the stars at night or dolphins during the day. Down another three steps is a corridor past the engine room and washing machine (which are enclosed completely) to two twin cabins (which can easily be adapted to become singles) and another toilet with a shower. 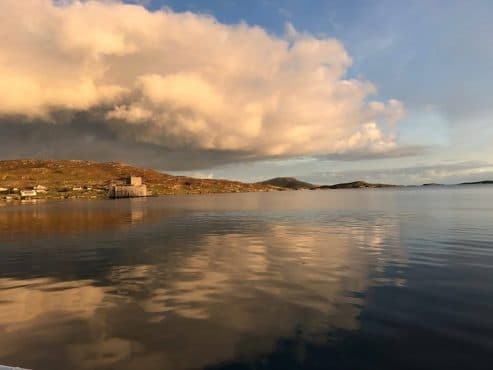 I endeavour to plan a comfortable voyage visiting new places everyday, of course the weather has the final say but my aim is to deliver the itinerary you have booked as weather permits. I like to be flexible, and we’ll have weather forecasts each morning, so over breakfast we can plan the day together. You may have a desire to go somewhere nearby and I will do my best to make this happen, likewise feel free to make contact with VentureSail prior to the voyage to discuss. Breakfast is usually served at 8am, with cereals, toast, porridge, fresh fruit, and yoghurt followed by a cooked option. This is also where the plan for the day is discussed, along with the latest weather forecast. We’ll have lunch whilst sailing, and it varies but you can guarantee there’s always lots of it! Soup and homemade bread, cold meats, salad, quiche, baked potatoes are just some of the options. 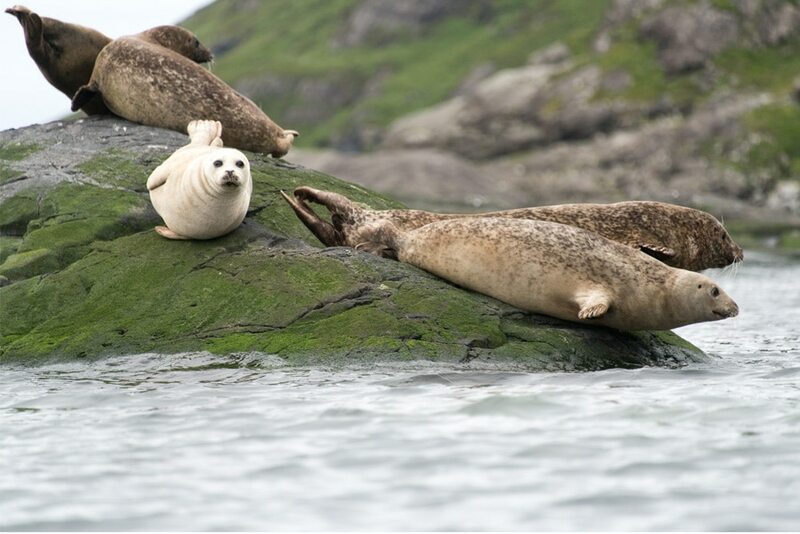 Some days may be a packed lunch as we are ashore walking or just sitting on a golden sandy beach, followed by an afternoon tea of cake or scones with tea and coffee if underway. Dinner is served between 1900 and 2000 and usually at anchor, having returned from a shore excursion to a hearty meal of local produce perfectly cooked by our onboard chef. A dessert or deluxe cheeseboard with drinks and coffee while we talk about our day winds up another VentureSail experience. 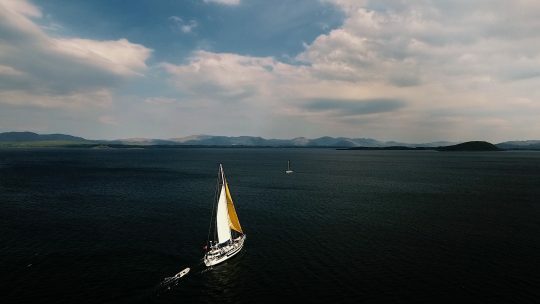 After sailing in so many seas around the world I can honestly say the west coast of Scotland is where my heart is! Sailing from Oban offers so many diverse options to explore this stunning corner of the planet. 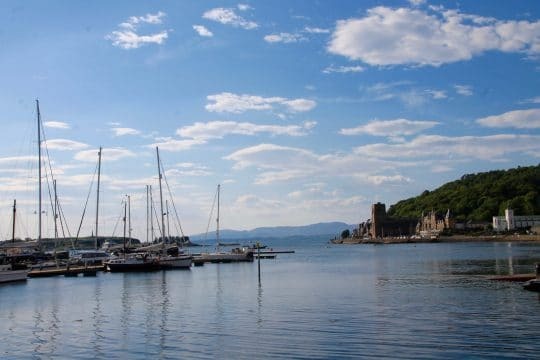 There are 790 islands in Scotland which vary in culture, language, music and, of course, whisky! The wildlife here is spectacular and a photographers dream. A single day can bring otters, many species of dolphins, basking sharks and as for birds… there’s no place like the Shiant islands or St. Kilda for colonies of tens of thousands gannets, puffins, fulmars, guillemots and more. 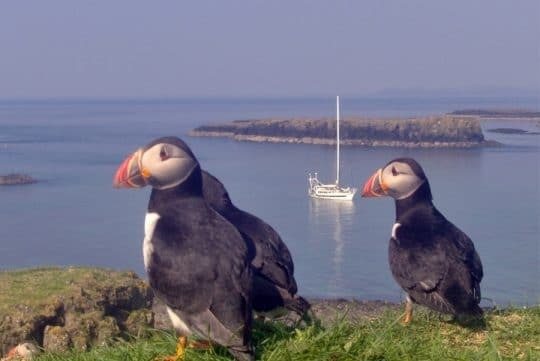 Just a short cruise from Oban takes you to the Treshnish islands, which is the place to get up close to puffins, or to Rum where the Manx shearwaters breed. One of the greatest, almost guaranteed sightings is that of golden and white tailed eagles – first mate Sarah is a bit of a fanatic and will be on deck spotting most of the time!